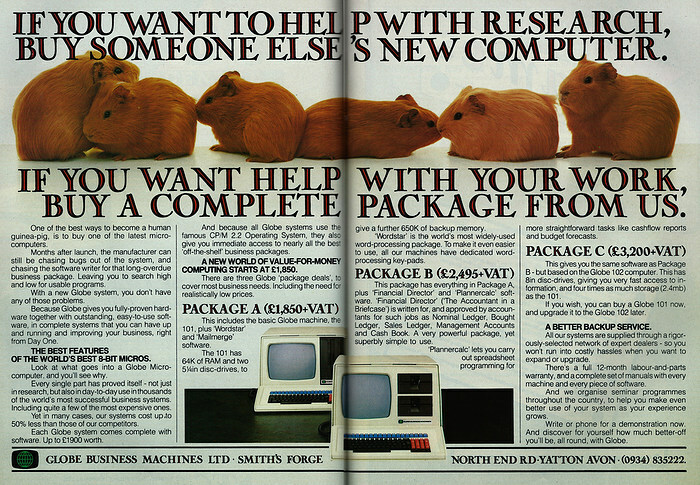 At almost the anatomically complete-opposite end of the scale to Commodore's Maureen the Elephant comes this advert featuring cute guinea pigs, from little-known Globe Business Machines Ltd, which seems to be saying nothing more readical than "buy our old stuff as it's well tested". That's not a bad idea in itself, however this particular machine - in the era of the IBM PC - was looking quite a long way backwards, with its Z80 and even 8" floppy disk drive option. The top-of-the-range "Package C" retailed for £3,680, or £12,300 in 2019 money.